“Kapelle” ("Chapel") is an installation composed of two vinyl tarpaulins hung parallel to each other, reaching from the ceiling to the floor and taking up the dimensions of the L-shaped room. 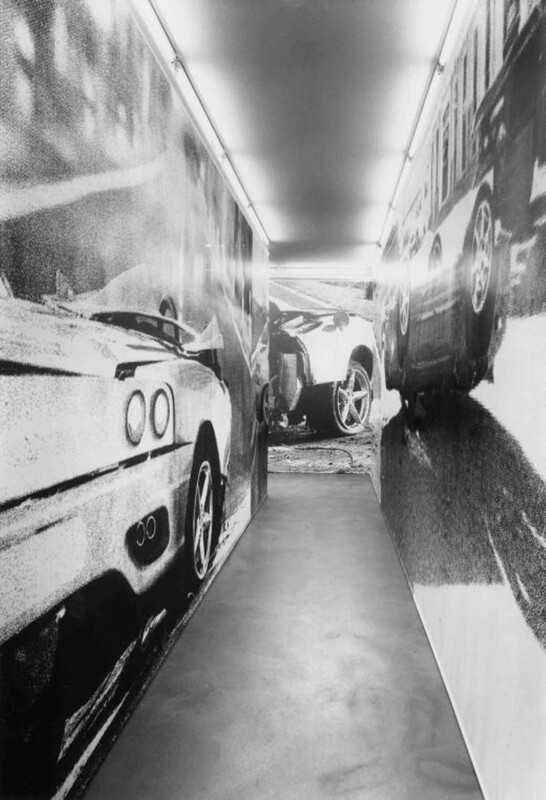 The corridor thereby constructed in the exhibition space contains, on its inside, an illustration along whose interior the viewer walks. 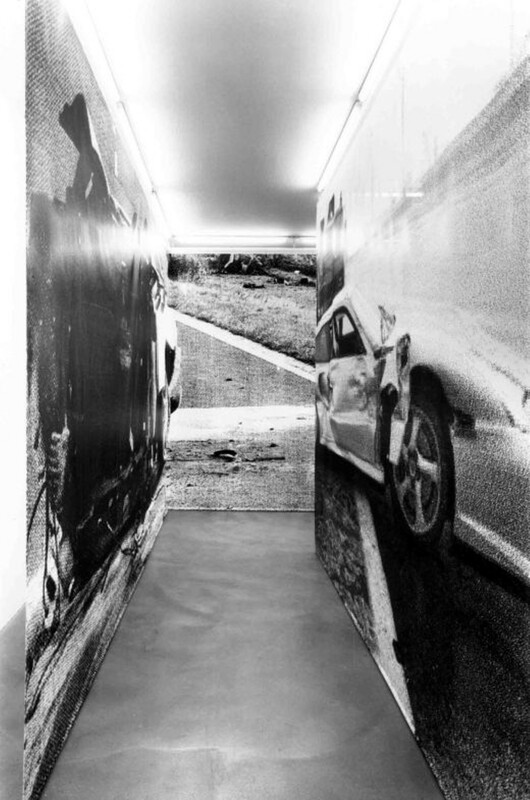 The sequence of black and white images is comprised of photographs of car crashes. Ambulances, which no longer contain a story themselves, but rather, like wooden crosses placed at the scene of accidents, only represent events with deadly consequences. These images illustrate, to a certain extent, the bestselling novel “Crash” by J.G. Ballard (1973)1, whose original cover is printed on the invitation cards. 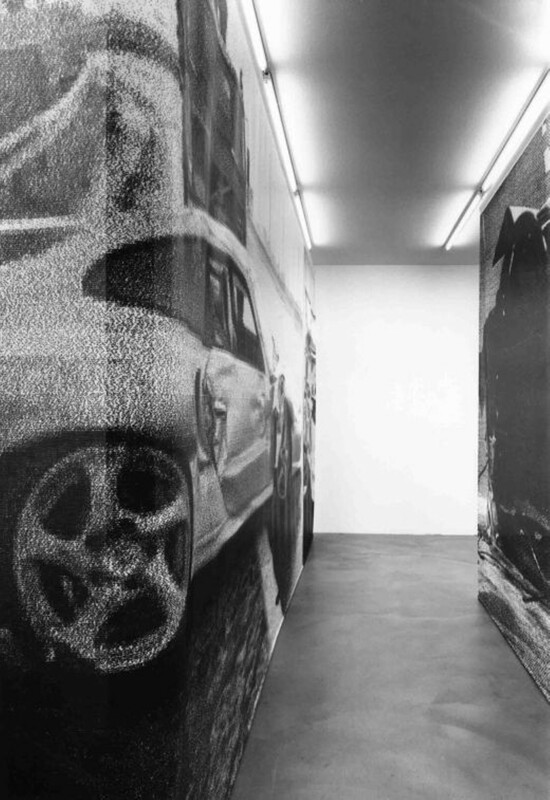 Both the materiality (truck tarpaulins) as well as the images are closely related to the exhibition “Into the Light” (2003), realized at the Ludwig Forum in Aachen. There the Cologne artist also gained inspiration from various sources, including the road movie “Two Lane Blacktop” (1971). In contrast to the concentrated materiality and atmosphere in the gallery exhibition, there diverse mediums such as painting, collage, sculpture and video were interrelated with each other. “Kapelle” as a title is, on one hand, an allusion to the spatial situation of a “devotional” place. On the other hand, Johannes Wohnseifer also refers to recent art history. 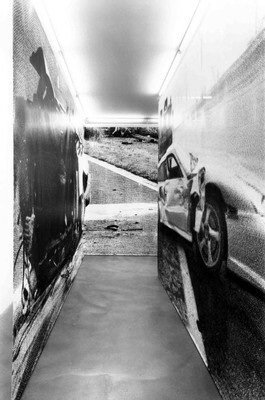 In this reference system, such cardinal artistic works as the Rothko Chapel in Houston (1971), Andy Warhol’s silk-screens of car crashes from the disaster series, cult movies such as Godard’s “Weekend” (1967) or even the science-fiction novel “Crash” become instigators of this devotional space. 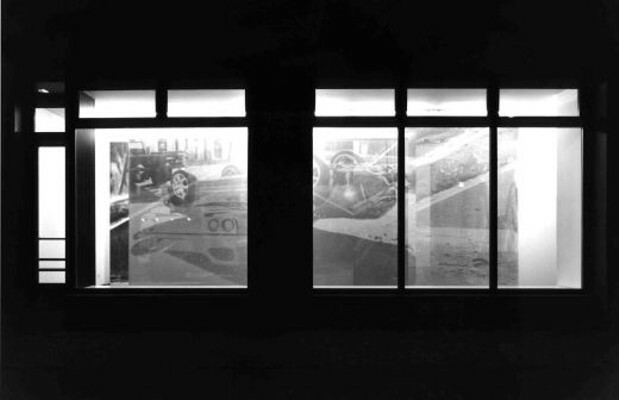 This stylization, that simultaneously incorporates repetition while containing a specific connection to the place, is often found in Wohnseifer’s work. Like in the installation “Museum” (1999, Museum Ludwig), where copies of Gerhard Richter’s eagle pictures were shown next to self-designed Adidas running shoes as a museum reference. Additionally the most recent exhibition “La Mano de Dios” (2003) also reveals this mode of operation. 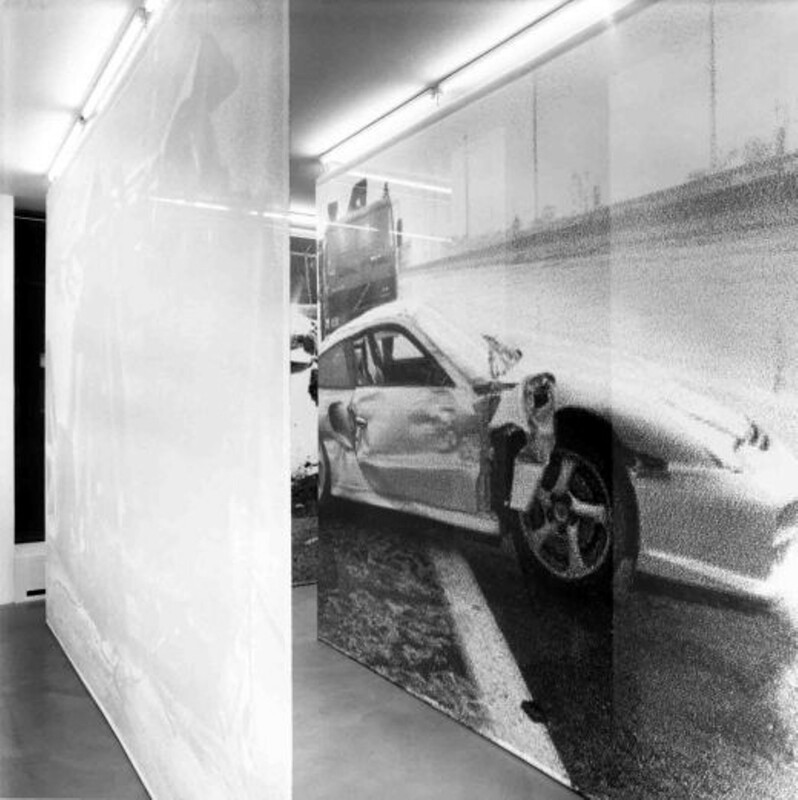 At the invitation of the Cologne Trinitatis-Church, Wohnseifer installed in the church works about the newly founded religious community surrounding the soccer star Diego Maradona, creating an ensemble about pop culture, art and religion. 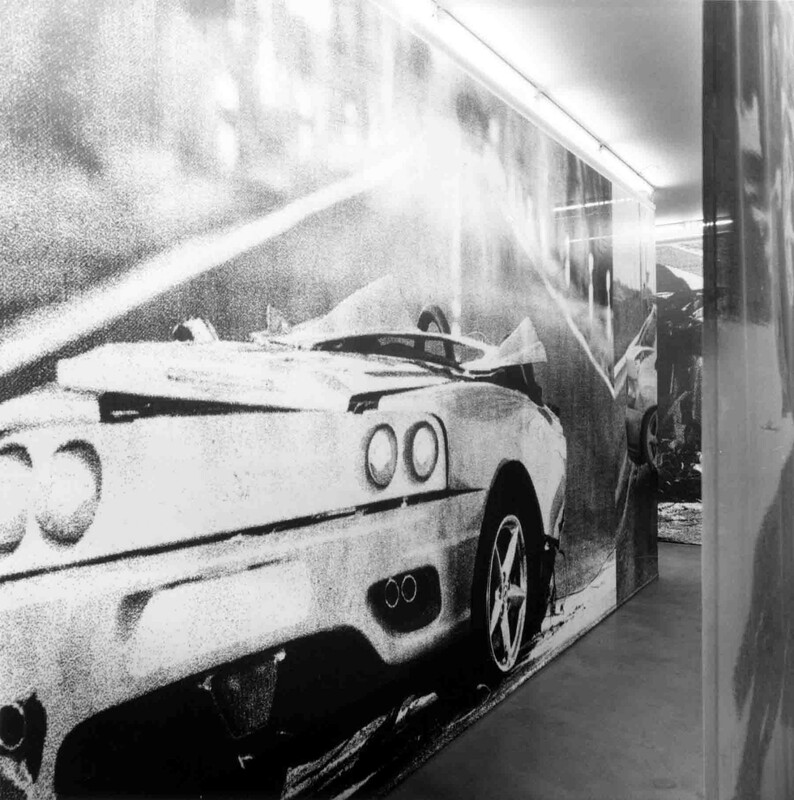 1 A science-fiction novel which is associated with the fetishization of speed and fast cars, culminating in ecstasy and death and which was the model for the film of the same name (1996) by David Cronenberg.